As many marketers and promoters know, one of the hardest things about branded promotional giveaway items is actually getting your customers to keep whatever it is you're offering. With all of the other items being offered, it can be tough to get customers to grab the item off of your table at a trade show or promotional event in the first place. But achieving the ultimate goal of getting your brand in front of them by getting them to actually leave the event with it is even more difficult. Having your customer keep your promotional giveaway item is (obviously) the most important part. After all, why spend all of that money on these products if they just end up left outside or forgotten on the bus? The key, then, is for your customer giveaway item to be "sticky", something a potential customer simply can't leave behind. To be sticky, your giveaway item needs to check off a lot of boxes all at once. Interesting - Grabbing attention amidst a sea of giveaway items is half the battle. Make sure you stand out! Useful - Customers are far more likely to keep something that actually benefits them in some way. Easy to carry - Customers will get the item at an event of some kind. It can't be cumbersome to carry around. Branded - What's the point in giveaway items if they don't put your brand front and center? Unique - Potential customers won't want the same ol' thing. "Oh, just ALL of those things? Piece of cake," you say. "While we're at it, I also need it to print money, fly and teleport me home during my evening commute." OK, sure, it does sound a little far-fetched. But promotional giveaway items that check all of those boxes aren't figments of your imagination. 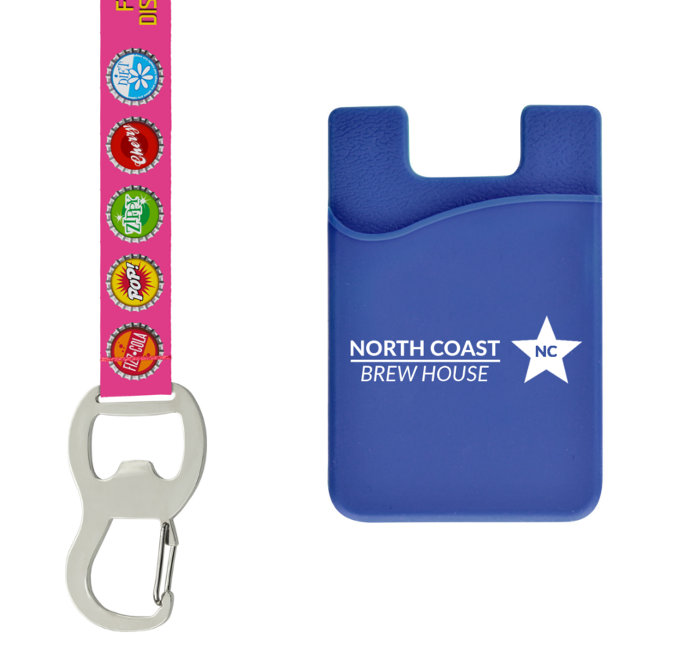 They exist, and we have two of them: custom bottle opener lanyards and custom cell phone wallets. 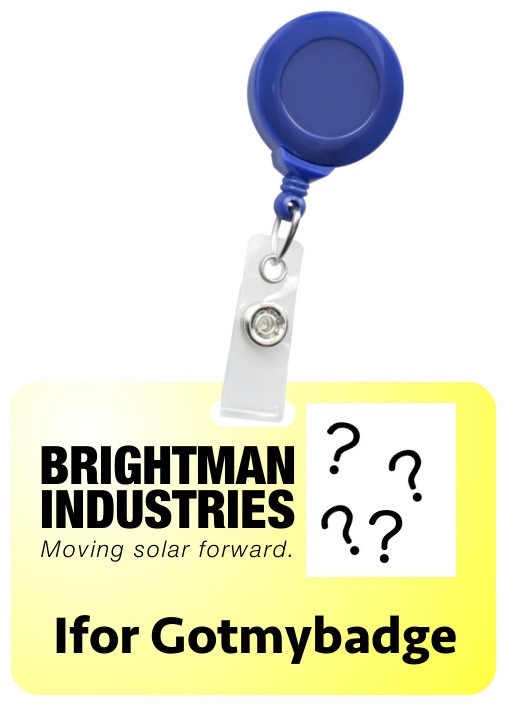 Why are custom bottle opener lanyards and custom cell phone wallets "sticky"? Cell phones. They're everywhere! No matter where you go, you'll see someone staring down at his or her hand, typing the day away or watching the 100th cat video on YouTube. Our cultural obsession with the cell phone has reached the point that the cell phone has replaced keys or a wallet as the one "can't leave home without it" item. Basically, you have your cell phone with you wherever you go. 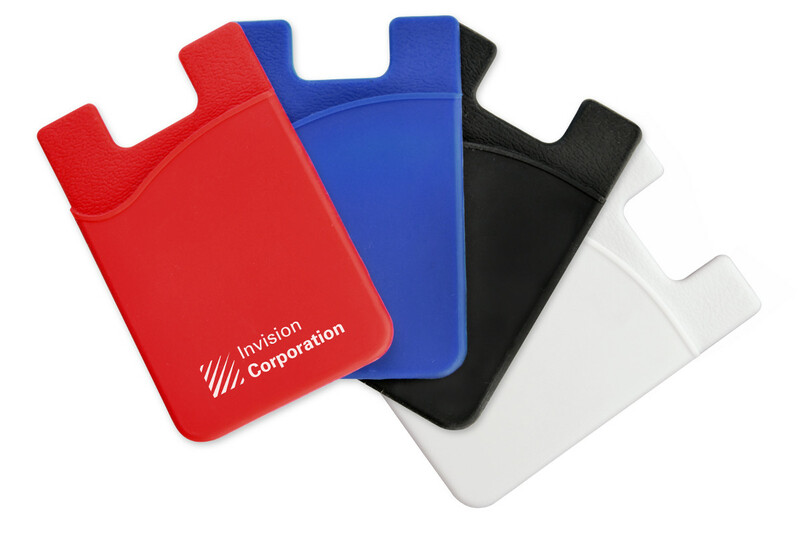 With that in mind, our silicone mobile phone wallets are a great way to cut down on the number of items you need to carry in that pocket or purse.